After attending a friends wedding we decided to watch a movie. 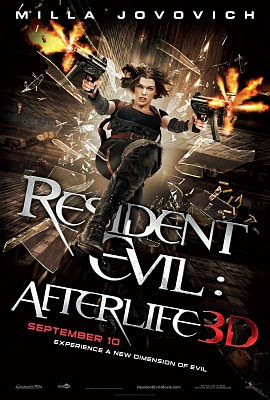 It was a choice between Despicable Me, Resident Evil: Afterlife or an asian horror movie currently shown. Resident Evil was the choice of majority in the group. I was an avid follower of the Capcom's Resident Evil game series in Sony PlayStation. I played the first 3 games and was able to finish them. The game was so addictive that I had to follow and watch the first movie adaptation. Most of the characters from the game is included in the movie but the storyline was entirely different from the game series although some concept were borrowed from the game. Resident Evil: Afterlife starts years after the events of the previous movie Resident Evil: Extinction. Alice's (Milla Jovovich) clones attacked Umbrella Corporation's Tokyo base but Albert Wesker was able to escape and purge the facility killing all the clones. The real Alice confronts him in the aircraft but he was able to inject her with a serum that neutralizes the T-virus in her system removing her super human abilities. The aircraft crashes before Wesker can kill her and she was able to survive the crash. Next scenes shows Alice looking for a place called Arcadia, where a broadcast was made that a safe haven for every living survivor of the viral apocalypse. 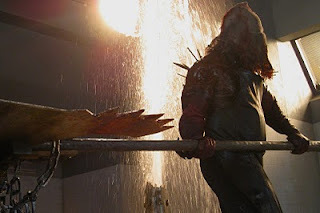 Several back scenes from the previous movie were shown as flashback. Upon locating the origin of the signal, she only encountered a deranged Claire Valentine (Ali Larter) suffering from memory loss. Traveling to Los Angeles, they met a group of survivors which created a maximum security prison as their shelter. They discovered Chris Redfield (Wentworth Miller) in one of the prison cells. The zombies find a way to get inside the prison so they decided to release him as he claims there is a way out of the security prison so that they can reach Arcadia which they discovered was a cargo tanker. 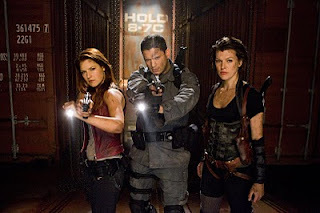 Upon battling a horde of zombies, Alice, Claire and Chris were able to reach the ship and find it abandoned. Further checking reveals that the ship was a trap set by Umbrella Corp. to collect the remaining survivors and conduct experiments on them. Alice finally discovers that Albert Wesker, just like her was able to survive the aircraft crash earlier. A battle begins between the 3 and Wesker, now with superhuman strength since he injected himself with the T-Virus. After defeating Wesker, a new set of umbrella aircraft arrives with Jill Valentine (Sienna Guillory), with the same mind controlling device, leading an army to fight against the three. This ends the movie for a possible sequel in the future. My personal rating for the movie is 6 out of 10 since I feel that there was something lacking in the plot. After making 3 movie series about zombies in an post apocalyptic setting, a question raises on how will you present the same zombies in a different way that it would not look like the previous films. Maybe that is why zombie was only shown 30-40% of the screen time, since there was no way you can present the same villains on a fourth installment of the series. Even the fight scene with Executioner was a little bit short from what I expected. What's more a little bit confusing is the Executioner just walk right into the prison gates and knock it off, no explanation where it came from. Let's just hope that if there will be a sequel coming up, they can make it better this time.